South Down MP Margaret Ritchie has tabled a Parliamentary motion at Westminster calling for St Patrick’s Day to be made a full Public Holiday in Northern Ireland. Speaking from the Commons, Ms Ritchie said: “In South Down we are incredibly proud of St Patrick’s heritage and I am asking for the day to be given full Public Holiday status in Northern Ireland, so that all of our people have the chance to celebrate his legacy. The St Patrick Festival across the world is a major celebration. 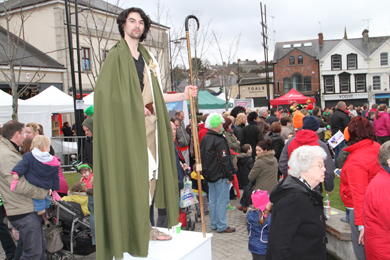 Pictured is a youthful St Patrick during the Downpatrick festivities. “This holiday should be a celebration of our shared history and a genuine attempt to find a symbol that unites and reconciles our people rather than divides them. St Patrick is a figure that can be celebrated by people of all religious traditions and beliefs. It is an inclusive tribute to our common heritage, which we share with people from around the world. “The worldwide celebrations show that the legacy and impact of St Patrick’s message are universal. This year, landmarks around the world, including the Rock of Petra and the Pyramids, will be lit green to mark the occasion. While St Patrick’s Day currently has bank holiday status in Northern Ireland, by making it a full Public Holiday we would be sending out a clear message that we want to be at the centre of this global celebration and that it is a celebration for all of our people. “We want to encourage tourists to come to Ireland during March and to visit the Downpatrick, Saul and the Lecale area to see the main Patrician sites: St Patrick’s landing site at the River Slaney at the mouth of Strangford Lough; his first church, abbey and pilgrim site at Saul where he took healing waters at Struell Wells; Sliabh Padraig monument at Saul; his burial site at Down Cathedral in Downpatrick and St Patrick’s Catholic Church in the town where there is a shrine dedicated to our national saint. “We are used to symbols and history causing division and conflict. Let us place St Patrick at the centre of our attempts to celebrate all that we have in common. I believe that by making St Patrick’s Day a Public Holiday we would be making it clear that this is a day for all of our people,” added Ms Ritchie.